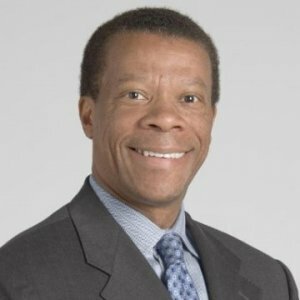 In addition to his responsibilities as Chief Information Officer and Chairman of the Information Technology Division, Dr. Martin Harris serves as Executive Director of e-Cleveland Clinic, which is a series of e-health clinical programs offered over the Internet. Dr. Harris’s interest and expertise in the area of improving the practice of medicine through the innovative application of information technology is reflected in his serving on numerous national policy and technology organizations. He was appointed to the U.S. Department of Health and Human Services’ Health Information Technology Standards Committee, which is charged with making recommendations to the National Coordinator for Health Information Technology on standards, implementation specifications, and certification criteria for the electronic exchange and use of health information. He serves as Chairman of the Board for the Health and Human Services Board of Regents of the National Library of Medicine, which acts as an advisory body to the U.S. Secretary of Health and Human Services. He also is Chairman-elect of the Healthcare Information and Management Systems Society. Dr. Harris received a presidential appointment to the Commission on Care for America’s Wounded Warriors and to the Congressional Commission on Systemic Interoperability, which studies the steps required to develop a national health information network. He also is the former Advisor to the Director of the National Institutes of Health. After receiving his undergraduate and medical degrees from the University of Pennsylvania in Philadelphia, Dr. Harris completed his residency training in general internal medicine at The Hospital of the University of Pennsylvania. He completed a Robert Wood Johnson Clinical Scholar fellowship in general internal medicine at the University of Pennsylvania School of Medicine and holds an MBA in healthcare management from the University of Pennsylvania’s Wharton School. As Chief Information Officer, Dr. Harris oversees policies that are modeled on good governance principles for nonprofit corporations, are consistent with legal requirements and help ensure that we fulfill our mission for the benefit of the community. expert when it comes to healthcare IT standards." Thermo Fisher Scientific is the world leader in serving science, and supplies a complete range of products, services and solutions for research, analysis, discovery and diagnostics. We serve customers within pharmaceutical and biotech companies, hospitals and clinical diagnostic labs, universities, research institutions and government agencies, as well as in environmental and process control industries. Our mission is to enable our customers to make the world healthier, cleaner and safer. JobsOhio isn’t your typical governmental agency. We’re a corporate non-profit, run by people who bring proven experience with America’s most successful corporations. JobsOhio benefits immeasurably from a truly world-class board of directors. These are people who are making an impact on the global economy, from higher education and medical research to the world’s most popular consumer brands. HealthStream is a leading provider of learning and research solutions for the healthcare industry, transforming insight into action to deliver outcomes-based results for healthcare organizations. Through HealthStream’s learning solutions, healthcare organizations create safer environments for patients, increase clinical competencies of their workforces, and facilitate the rapid transfer of the latest knowledge and technologies. KEYNOTE INTRODUCTORY ADDRESS: Where Does the CIO Go From Here? Is Digital Health Here to Stay? During the past decade, the impact of health information technology (HIT) systems on the contemporary medical practice model has been transformative. From physician connectivity promoting multidisciplinary collaboration, to secure patient access to medical information and services through personal health records systems, HIT is fast becoming a medical tool that may become as indispensable as a stethoscope or an X-ray. Dr. Harris reviews key features of an HIT-enabled practice environment. Healthcare Technology: Where Does the CIO Go From Here? Traditionally, the hospital and the clinician have been the primary owners and manipulators of health information. Now with a definite trend towards patient engagement in healthcare, how do hospital leaders manage patient consent, security, and the flow of patient health information leaving the hospital? Can global internet portals pave the way, or will hospitals and governments have to build the necessary infrastructure? Dr. Harris outlines recent developments in health information. When we grocery shop or make travel arrangements, the payment experience is seamless and transparent. Not so with healthcare! There is confusion about who pays what part of the bill, when to pay, and more. In the healthcare financial network of the future, a simple card swipe will initiate all transactions behind the scenes and send data to an online consumer/patient portal for 100 percent transparency. How? Dr. Harris outlines how to achieve a seamless customer experience in healthcare. A common challenge for healthcare provider organizations is balancing an increasing demand for services with decreasing financial resources. Progress in implementing health IT systems can still be made by strategically linking technology-related projects to patient outcomes to improve the healthcare value equation. Dr. Harris explains how healthcare decision makers can develop projects that will enhance their organizations’ ability to succeed in the contemporary healthcare environment. Dr. Martin Harris delivers a compelling examination of how advanced information technology tools (beginning at Cleveland Clinic more than a decade ago with the introduction of an integrated electronic medical record system) are changing virtually every aspect of how and where healthcare services are delivered. Dr. Harris demonstrates how a cohesive, strategic approach to a 21st century model of technology-enabled healthcare may help improve patient outcomes and manage costs.